"Fun, funny, tender and provocative all at the same time." Sometimes it takes an elephant in the room to show you what you believe in. 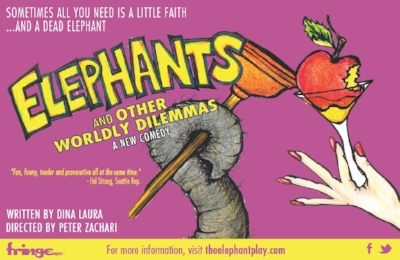 Elephants and Other Worldly Dilemmas is a comedy about faith and how it affects the decisions we make. Martha is a devout receptionist who can't make decisions without a sign. Seth is Martha's superhero-scientist-coworker who challenges her to leap, whether there's a sign or not. Sal is a computer nerd who’s in charge of other people’s technology, but lost in his own life, until one night he stumbles into Crystal, a devilish bartender who’s always in charge. When Fred, a mysterious temp comes along to be there when people need him the most, we see that Fred just might need the most help of all. Join this motley crew on a mystical ride and discover that sometimes all you need is a little faith and a dead elephant. In the summer of 2015, Elephants and Other Worldly Dilemmas premiered at the NY International Fringe Festival. All but one show were sold out, and the play went on to win FringeFav. It all began as a conversation I overheard in the waiter station at work. Two people talking about faith and water cleanses in the same sentence. Seriously. The writer in me knew there was a story to tell, and the actor in me wanted to be the one to perform it! Faith is the thing that everyone thinks about, but no one wants to discuss except with his or her therapist (or these days, a life coach). In a sense, it's the "elephant in the room." And thus, my play was born! The story evolved out of the one act play The Day Martha Chose to Ignore God. Given a title like that, it was only fitting that the development of it proved to be the ultimate test of my faith... in myself. This piece pushed me to write about things I never even dreamed of... from water cleanses and superhero scientists to computer nerds and stampeding elephants. It's been an amazing journey thus far, and the best is yet to come!